Sell your generated Gift card to win more customers.. Allow your Customer to Redeem Gift Card, Buy Gift Card worth $$ at less price. Now you can also give free credits to customers such as big companies do. You will be able to generate a coupon with a specified value. New customers that use your gift code and amount will be directly credited in their account but they can't use it unless they add some money or purchase first product. To stop abuse we added this feature and your client will be need to at lest have 1 transaction to use gift card. Why use our Gift Card Module? By default WHMCS allows you to generate coupons and the client can use your coupon while placing his order. This module also allows your client to directly receive money in their account. For example, should you create a Gift card worth $20, the amount of $20 will be credited to your client’s balance. One Time Gift Code or Unlimited Time (One time use only by each customer). Much More - Please see full feature list. Q1. What is Price of Your WHMCS Gift Card Module? - Normal Price is $20 per year with Free Upadate/Support. Q2. What is the price of a Full Source Code? - $299 with 12 months of free update & support. How Many domains can you cover after the purchase of a Source Code License? - 5 Domains but you can use it only on your own domain and it is not allowed to sell it or rent it to someone else. Q4. What is the price of Update/Support after 12 months for a Gift Card Source Code License? - $10 an year only. Q5. Setup Time for Regular License? Q6. Software Code is Encoded? - Yes, To prevent Abuse Source Code is Encoded with IonCube however If you need Source Code then you can purchase "Full Source Code" Module. Q7. Can I Change my Domain? - If you purchased Regular Yearly License(Encoded Code) then you can change it from our client area but If you purchased source code then please inform us about changes. - Demo is Available, Click Here (User: pm & Pass: pm - Click on Checkout, Proceed order and Under "Additional Requirement Info" enter Test Gift Code: GD4UUFV01V ) - Trial is not available at the movement. Q9. Which Version of WHMCS is supported? - v6 to 7.x Latest. 1. An admin can create a Gift card from the Admin Area. 2. An admin can remove a Gift card. 3. An admin can view active gift codes. 4. An admin can see the coupon used from Client Profile >> Edit Profile or by logging as client and editing the profile. 5. An admin can see the coupon used from Client >> Redeem Gift Card. 6. The same gift code can be used unlimited times by your different different client unless you remove your Gift card. 7. An admin can add a Gift card as a Product and sell it (it is fully automated). 8. An admin can create two types of Gift codes. By default, he can create a one-time use only Gift code that will expire after the first use and if he selects the "Unlimited" option, it can be used by many customers and will not expire unless admin removes it from the Gift Card Admin Section. However, a single customer can only use a Gift code one time. 9. 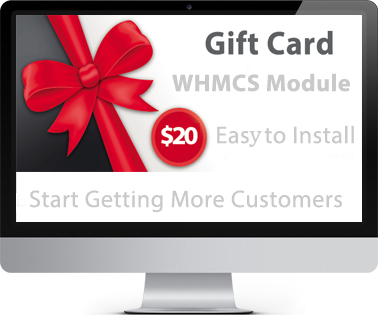 An admin can customize a template of Gift Cards from the WHMCS Email Template Section. 10. An admin can hide the "Buy Gift Card" link. 1. A client can apply a Gift code while placing an order. 2. A client can apply a Gift code while creating a new account. 3. A client can Redeem a Gift Code from Redeem Gift Code. He would need to login to view this menu. 4. Can purchase a Gift Card. 5. A client can view the status of code used by him/her from the Redeem Gift Code Page. 6. If a client purchases a Gift Card, it will be automatically added to the "Redeem Gift Card" page and an email will a Gift Code will be sent to their email also. 7. New customers can redeem a Gift Card while placing an order or using the Redeem Gift Code page but can't use Gift Card Funds unless they purchase a product, add funds or make a transaction. What it means is that a customer must create at least 1 transaction using any available payment method. Buy with PayPal, PerfectMoney and Bitcoin! Instant setup for Regular Encoded Module and 24 Hours for Full Source Code.